After a two-year hiatus, Mix Magazine has revived Mix Nashville, a signature professional audio event. On Aug. 29, presenters and performers and workshops will be gathered in the newly refurbished Clair Southeast facilities and the new stages and production rooms of The Blackbird Academy. Sister magazine Pro Sound News has partnered for the local Nashville AES Section. New for 2015 is The Interview Stage, The Master Class Stage, and The Exhibitors Network. Speakers include engineer Steve Marcantonio, producer/engineer F. Reid Shippen, producer Chuck Ainlay, engineer Jeff Balding, and many more. 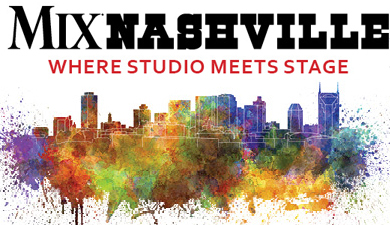 First presented in 2008, Mix Nashville established itself as a hands-on, professional audio event, with a blend of editorial panels and technology presentations. Ensuing years would bring live performances, real-time soundchecks and special “Anatomy of a Hit” panels detailing the production. Registration is available for $79.00. Students can register for $49.00.